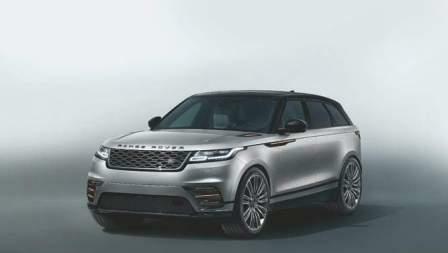 Move over, poser SUVs - the all-new Range Rover Velar is in town, and it's a beauty! Velar, once the code name for the first prototypes of the 1st generation Range Rover models, has been reinvented as an all-new distinctive model, slotted between the popular Range Rover Sport and the unisex Range Rover Evoque. The sleek silhouette is quite unlike anything we've seen before in a production model and it owes its spiffy form to cohesive fixture detailing - such as those slender wraparound LED headlamps, pop-up concealed door handles and available 22-inch wheels that fill the wheel wells to the brim. Inside, you have an evolution of clean interiors associated with Range Rovers, with seating surfaces covered in soft Windsor leather and an infotainment Touch Pro Duo featuring two 10-inch high-definition touchscreens. Choice of sound systems start with 17 speakers and goes up to 23 speakers with up to 1,600-watt output by master sound-makers Meridian - which sure adds some degree of decadence to the Velar! Under the clamshell bonnet, you can have a highly advanced four-cylinder Ingenium 2.0-litre 4-cylinder petrol engine, which delivers 250 horsepower, enabling acceleration from 0-100km/h in just 6.7 seconds. Alternatively, you can have the 3.0-litre supercharged V6 that makes 380PS at 6,500rpm and 450Nm of torque - enough to do the same in just 5.3 seconds. And even though this future-forward SUV is available in showrooms now, you need to get in line if you want one! The 2+2 Continental GT has been Bentley's pride since 2003. Its timeless looks have garnered fan following of a legendary status and it comes as no surprise that over 66,000 units have been sold till date. This 3rd generation, inspired by the lines of the EXP 10 SPEED 6 CONCEPT, has a gorgeous bodywork that is lighter by 80 kg - for the W12 model - and marks the first big transition in shapes between recent generations. The sportier, lowered nose, the new taillights - now shaped into ellipses that reflect exhaust tail pipes - and the general ornamentation outside and inside, will leave even British spies shaken not stirred. But you may have trouble deciding which of the 17 exterior paint colours suits your personality best! And that is not counting the multitude of personalised paints available! The majority of time we spend with our cars is inside and this Bentley lets you enjoy the lavishness of the flawless leather upholstery and the over-10 square metres of wood - which take nine hours to create, simply to add to the plush ambience. And for those seeking the luxury of crystal clear sound, you'd be surprised to know that the 1,500-watt 16-speaker system by Bang & Olufsen, with its illuminated speaker grilles, is only the secondary option to the primo Naim 2,200-watt, 18-speaker system. As for visuals, there is a 12.3-inch retina-quality digital MMI infotainment screen - Bentley's largest-ever touchscreen - that rotates to conceal itself. This is next level stuff! Covering ground is a cakewalk for this brute dressed in a suit. Just bury the throttle and you can experience the will of 635 horses and 900Nm of torque delivered from a re-tuned 6.0-litre, twin-turbocharged W12 TSI engine, mated, for the first time, to a dual-clutch eight-speed transmission. This gets it from standstill to 100 km/h in just 3.7 seconds and allows for an almost-ludicrous top speed of a horizon-meeting 333 km/h. With that kind of performance on tap, I'd say you'd be on Sport mode perpetually. Although, as with Continental GTs of the past, we expect it to be no less a Grand Tourer, thanks to its soft-as-pillows air suspension and latest-generation Continuous Damping Control suspension bits that keep things in control. This is Bentley redefining the term 'joy ride'. Twenty-eight years ago, the 1990 LS 400 became the original disruptor of the full-size luxury segment. It was the ultimate stylish, spacious, comfortable, fast and well-equipped luxury sedan from the East. And history may well repeat itself with the all-new 5th generation model that first showed its face at the 2017 North American International Auto Show. This time, it leaves its conservative looks for a more coupe-like stance punctuated by the aggressive Lexus design language - as we have seen in most Lexus vehicles of late. And it does that by incorporating that signature highly-stylised spindle grille, slim lighting fixtures and carved metallic skin. You are bound to hear that newfound vigour in its re-tuned exhaust note as well. Once again, Lexus has applied Omotenashi - the Japanese concept of hospitality - to this automobile as well, which prioritises the needs and comforts of the driver and passengers, and helps protect them from hazards as a priority. It's easy to get comfy in the available 28-way power cosseting front seats, but the rear seats are where you want to be with their up to 48-degree recline, Shiatsu massage feature and a raised ottoman. They have also added new sound suppression methods like Active Noise Control that negates even engine sound coming into the vehicle, while the 3D surround Mark Levinson audio package, with in-ceiling array speakers, will give you the complete breadth of sound. As for instrumentation, in addition to its 12.3-inch wide navigation display, the LS can be equipped with an optional 24-inch colour heads-up display (HUD) - the largest in the world. Japanese tradition is further exhibited in the décor with inspired-by-Shimamoku wood patterns; these new forms that combine the artistic combination of natural woodwork and application of Japan's sophisticated sliced wood and laser-cutting manufacturing technologies. Dynamically, the weight reduction of nearly 100 kg ups agility while allowing the all-new twin-turbo 3.5-litre V6 engine, with its 415 horsepower output, to do what it does best - provide thrust! And with that, burying the throttle would be like throwing down the gauntlet on any 'wannabe' racers. As for the almost-superfluous 10-speed automatic, it's the perfect ice-breaker at those awkward business meetings. The once-ugly duckling has risen to be the German automotive brand's success story - not just as an SUV but as a vehicle that has outsold even their renowned sports cars. The Cayenne has been the go-to SUV for people looking for brand equity, luxury and performance since 2002. Aesthetically, the incoming 3rd generation may share a similar face with the outgoing, but the strip lighting, inspired by the Panamera Sport Turismo concept vehicle, is a perfect fit to that rear end. With German quality on board, there is little to be feared in terms of fit and finish. Inside, you have a Panamera-inspired centre console with Direct Touch Control and a new 12.3-inch touch display to go with the rising button console finished in glass. There is also a race-derived 3-spoke steering. The performance bar has been raised significantly too, mainly thanks to a 3.0-litre 6-cylinder turbo engine that delivers 340 horsepower in the Cayenne and 440 horsepower twin-turbo 2.9-litre in the Cayenne S, helping it get from traffic light to 100 km/h in 6.2 seconds and 5.2 seconds, respectively. And for the ultimate price, you get the ultimate prize in the form of a 550 horse-strong biturbo 8-cylinder engine that makes a rocket ship of this SUV, helping the needle blitz past the 100 km/h mark in 4.1 seconds and achieve a top speed of 286 km/h. Do note that optioning your Cayenne with the Sport Chrono pack just makes everything faster. Then, there is an innovative 4D Chassis Control that integrates all performance parameters and responds accordingly; rear axle steering - a first for Cayenne; and superior brakes with tungsten-carbide coating for a 30 per cent increased longevity and less dust accumulation. all for the sake of better dynamics. The highlight, however, is the Porsche Active Aerodynamics (PAA) pack that adds an adaptive roof spoiler that adjusts its angle for better aero'. and the surprising fact that Cayenne models are now around 95 per cent recyclable. Let the records show they fighting the right fight! George: Much appreciate your response! We reviewed the Toyota Prius back in 2016. And we did like it for its exceptional fuel economy, build quality and its general ride and handling characteristics. But we weren't fans of the centre seat comfort in the rear and the fact that it didn't come with a sunroof. Plus, the price differential over a Toyota Corolla could only be offset if the car was driven over a substantial distance. We gave it 8/10 overall. Please check out our archives for the review. As for other such cars, we plan on reviewing the Tesla models soon and hopefully the Zoe too.